The Hoya 77mm Multicoated Close-up Lens Set is a set of three close-up lenses for use in achieving macro-like results with almost any camera lens you pair them with. Close-up lenses are magnifiers that optically decrease the focal length of a camera lens it is placed on. This effect lessens the minimum focus distance between your camera lens and an object. Magnification can then be obtained while photographing an object by moving the front of the camera lens close to it. The magnifying power of each close-up lens is indicated by its diopter strength. A close-up lens with a higher diopter number provides more relative magnification and can be combined with other close-up lenses to increase or fine-tune its effect. These lenses are multicoated to help reduce flare and improve light transmission. Close-up lenses decrease the minimum focus distance of almost any camera lens, providing macro-like results. +1, +2, and +4 strengths allow you to vary and modify your desired close-up effect. Dual threading permits you to combine the close-up lenses together or pair them with filters. 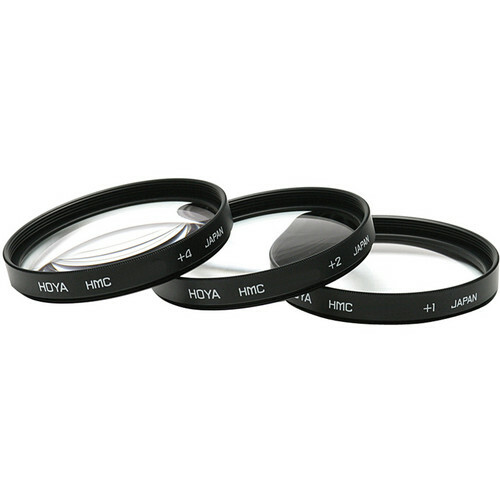 Box Dimensions (LxWxH) 9.5 x 4.5 x 1.5"
77mm Multicoated Close-up Lens Set is rated 4.3 out of 5 by 8. Rated 3 out of 5 by Bucky Beaverbrook from Fun accessories for unusual macro shots Overall, these things don't feel or seem like essentials for photography. I bought them because I thought they looked interesting, especially after watching a youtube video by one of the online reviewers. They are not a substitute for real macro lenses. You cannot use autofocus properly, and the depth of field is so shallow that you basically will want to use them to focus on a particular point or plane and have everything else recede into incresasing blurriness. But that is a cool effect, and if you are tired of not being able to shoot stuff really close up, this is a kind of solution. Just be aware that, for example, if you photograph a flower or a leaf, you can expect to have only one flower or vein in very sharp focus. Rated 5 out of 5 by Central PA Photographer from Good for close up So far I have greatly enjoyed the close up lenses. With macro photography not being my main focus but rather a curiosity I opted for these over a macro lens. There are some draw backs such as some vignetting at wider views and some lose of light. A tripod is preferred and almost necessary on cloudy days. This is not a problem however patience is also required as if it is windy, you'll have to wait for the flower, insect or whatever you're shooting to be perfectly still. I also recommend using live mode so that your mirror is flipped up and will cause less vibration. I chose this over the canon close up lens because this comes with +1 +2 and +4 lenses whereas the Canon lens is only a +2. If macro photography has peeked your interest than this is a great way to test out the water. If macro is going to be your full time break and butter you will eventually want a dedicated macro lens. Rated 4 out of 5 by Kyle W. from Pretty sweet concept! Now we're not getting a macro lens... ...although we're going to try some macro rings now and are returning these... The filters are ok, but they do have decent distortion and you have to get ones that fit your lenses. But our issue was that the filters came with some marks and blemishes on the coating that caused some blurred spots on our photos. And the glass on one of our filters was loose as well. Rated 4 out of 5 by Pachobog from Easy to carry, great pictures Sometimes can't carry all the lenses and this is an acceptable substitute for a macro, given weight/space. Rated 4 out of 5 by GW from Easy to install I used this the other day for macro shots with my wide angle lens. Gave me some close up shots otherwise not available. Happy I made the purchase. Rated 5 out of 5 by DHFernandez from Love! Great alternative to a Macro Lens! Love these! I didnt want to invest in a macro lens just for detail shots! The quality is great and I highly recommend! Can't beat the price! Rated 4 out of 5 by Stewie from Easy to Use Quick and easy to attach to the camera and take a close up of Christmas Ornaments. Rated 5 out of 5 by stu from Worked Just fine Worked Great for close up on location in an industrial setting. What is the difference between the A-77CUS-GB and the B-77CUS-GB Hoya 77mm close up lens sets? This set of close up lenses is multicoated, whereas the latter is not. Yes, you can stack any combination of the 3 filters to increase magnification. It is recommended that if you do so, you do not use auto focus to protect the drive motor.